bases add another dimension to the voyage. Our classic 10-night expedition features many of the wellknown landing sites such as Neko, Paradise and Orne Harbours, Cuverville Island and the Errera Channel - and ice conditions permitting, we hope to transit the spectacular Lemaire Channel. Pleneau Island, Petermann Island and the iceberg-filled Penola Strait are all possibilities below the Lemaire. A further highlight will be a visit to the enchanting South Shetland Islands. Here, we hope to visit Deception Island and other nearby locations such as Half Moon Island, Hannah Point or Yankee Harbour. 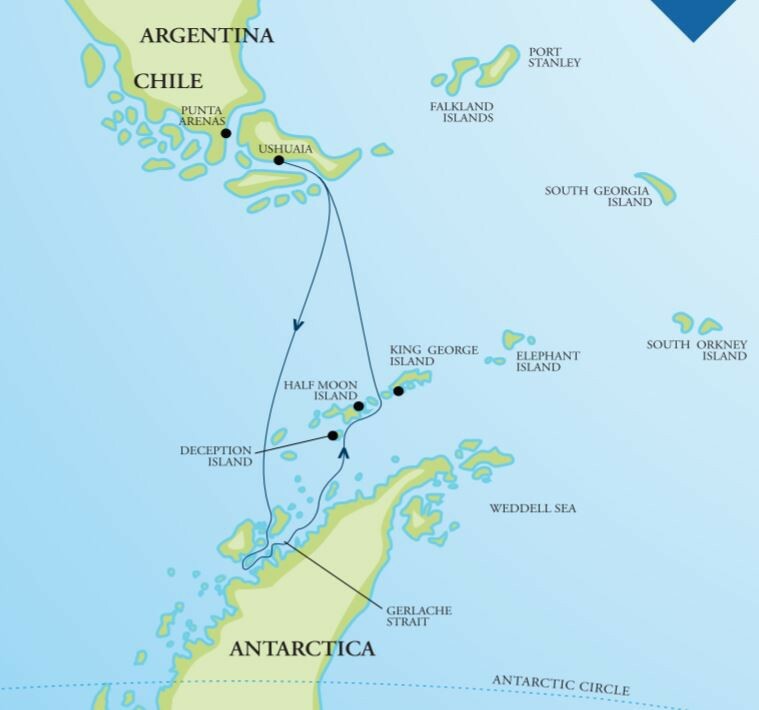 Returning to South America we have one final thrill - rounding the legendary maritime landmark of Cape Horn. We awaken today and the magnificent snowy peaks of continental Antarctica are laid out before us. Even our experienced expedition staff, some with more than 100 journeys south, will take a moment to pause and reflect on this incredible sight. Take a deep breath – you have arrived. This is Antarctica. The waterways of the Antarctic Peninsula are home to deep bays, pristine coves and inlets and numerous small islands. The Gerlache coastline features heavily glaciated mountains permanently covered in ice and snow. Rocky outcrops, known as ‘nunataks’ are home to gentoo, Adelie and chinstrap penguin rookeries and the waters are rich in marine life. We frequently encounter seals, including the powerful leopard seal, usually found hauled out on an ice floe. Curious humpback whales and the smaller minke whales are present much of the time as they feed on the vast schools of krill. Sightings of orca are not uncommon. Our activity program is in full swing and we encourage all guests to choose how their adventure unfolds. Every day we plan an exciting range of activities, including guided hikes on shore (both short and long), visits to wildlife colonies with our expert naturalist guides. The historic huts and science stations located along the peninsula provide a fascinating glimpse into the past and the present. Zodiac cruising among the ice searching for seals and whales is a memorable activity. Meanwhile, our sea kayakers may explore several miles from the ship experiencing Antarctica from an entirely different perspective. Our resident photography guide will be on hand to help you with your camera handling and image composition. Maybe what you really want to do is sit on a rock, simply watching the penguins come and go from the water? Make yourself comfortable and enjoy the show. Planned excursions along the Antarctic Peninsula could include Cierva Cove or Mikkelsen Harbour, Danco Island, the Melchior Islands and Fournier Bay - or a cruise through the Errera Channel to visit the gentoo penguin rookeries at Cuverville Island. Wilhelmina Bay is another favourite location and one where we frequently encounter playful humpback whales. Nearby, Paradise Harbour is a particular highlight and offers an excellent hiking route to a viewpoint providing expansive views. Andvord Bay and Neko Harbour provide yet another continental landing opportunity. It is somewhere along this stretch of coastline that we plan to spend a night on shore, camping in Antarctica. We have all the right gear and equipment and an expert team to make it happen - all you need is an adventurous spirit! If the weather is good and site characteristics suit our requirements, we will always go for it. Camping is included in the voyage price and there is no need to pre-book this activity. After several busy days of exploration along the Peninsula, we head north across the Bransfield Strait, bound for the South Shetland Islands. This is an important whale migration corridor and we can expect sightings of humpbacks, or the resident pod of Orca that inhabit this stretch of water.